Subject: Implementation of Government’s decision on the recommendations of the Seventh Pay Commission – Revision of rate of Training Allowance. In continuation of this Department’s O.M. No.13024/01/2016-Trg. Ref dated October 24, 2017 on the subject cited above, the undersigned is directed to state that the Office of the Comptroller and Auditor General of India has conveyed their ex-post facto approval for the applicability of the OM No. 13024/01/2016-Trg. 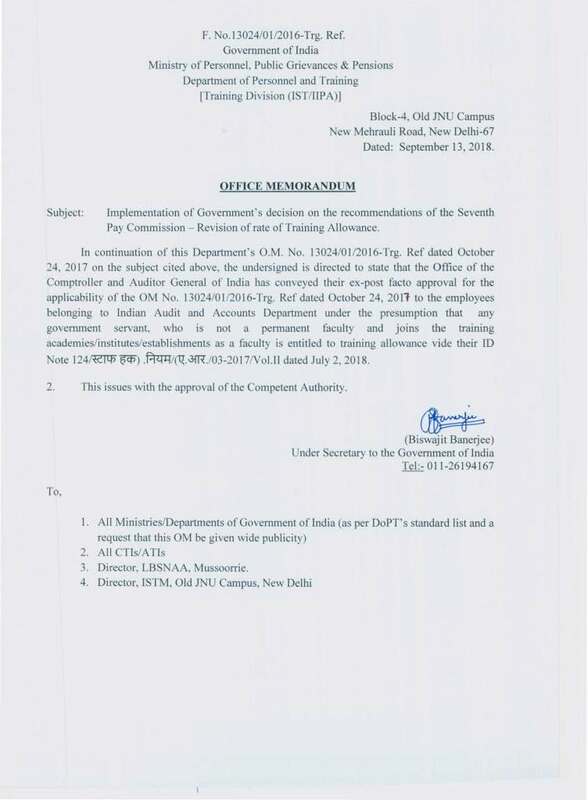 Ref dated October 24, 2017 to the employees belonging to Indian Audit and Accounts Department under the presumption that any government servant, who is not a permanent faculty and joins the training academies/institutes/establishments as a faculty is entitled to training allowance vide their ID Note 124/03-2017/Vol.II dated July 2, 2018.